Michelle Bachelet of Chile, newly-appointed as the next UN High Commissioner for Human Rights by Secretary-General António Guterres. 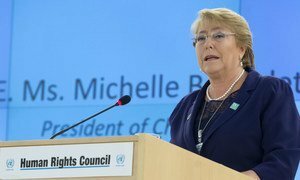 The United Nations General Assembly in New York on Friday approved the nomination of former two-time President of Chile, Michelle Bachelet, as the next UN High Commissioner for Human Rights, effective from 1 September. Minutes after she was approved, UN chief Antonio Guterres told reporters he was “delighted” by the news of her official appointment as Ms. Bachelet, a "pioneer", has been "as formidable a figure in her native Chile, as she has at the United Nations”. “She has lived under the darkness of dictatorship,” he continued. “As a physician, she knows the trials of people thirsting for health and yearning to enjoy other vital economic and social rights. And she knows the responsibilities of both national and global leadership”. Following the announcement, Ms. Bachelet said she was "deeply humbled and honored" to have been entrusted with "this important task." “Michelle Bachelet brings unique experience to the United Nations and to all of us, and is strongly committed to keeping human rights at the forefront of the work of the United Nations,” he concluded. “She has my full confidence and support, and I ask all Member States and our partners to extend to her their support”. Her predecessor in this position, Zeid Ra’ad Al Hussein, who took on the role in September 2014 and who Mr. Guterres described as having served with “leadership, passion, courage and skill” for the past four years, also warmly welcomed her appointment. “She has all the attributes – courage, perseverance, passion, and a deep commitment to human rights – to make her a successful High Commissioner,” he said on Friday in a statement, adding that the UN Human Rights Office (OHCHR) “looks forward to welcoming her and working under her leadership for the promotion and protection of all human rights, for everyone, everywhere”. Michelle Bachelet will be the seventh High Commissioner since the office was created in 1993. The High Commissioner, is the principle official who speaks out for human rights across the whole UN system, strengthening human rights mechanisms; enhancing equality; fighting discrimination in all its forms; strengthening accountability and the rule of law; widening the democratic space and protecting the most vulnerable from all forms of human rights abuse. Coming up next week, watch out for our in-depth interview with Zeid Ra'ad Al Hussein, who reflects on the "central duty" of the High Commissioner to defend rights on behalf of the world's most marginalized. Catch it on video, podcast and text. 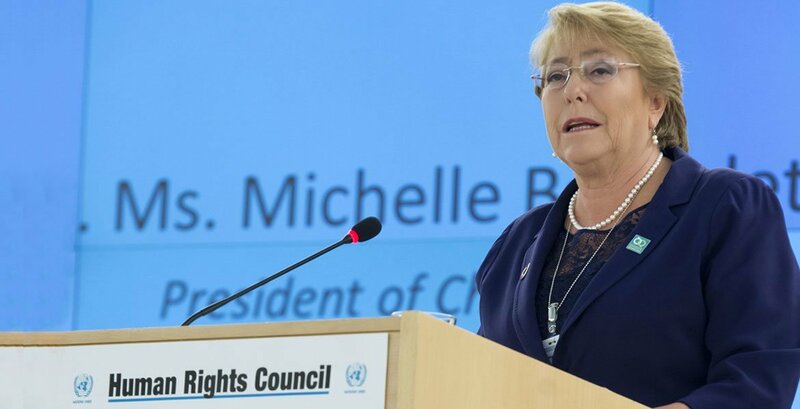 She has twice been President of Chile, and on Wednesday, ground-breaking politician and women’s rights champion, Michelle Bachelet was nominated by the United Nations chief António Guterres for the key post of High Commissioner for Human Rights.